Your ceremony should be an expression of your heart and soul. Simple or elaborate, traditional or cutting-edge, formal or casual, Capital Ceremonies will create and perform beautiful and meaningful weddings, baby blessings, or memorial services tailored just for you. You and your loved ones will cherish the experience for years to come. I am A.C. 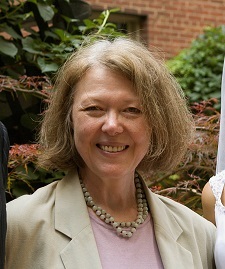 Warden, a certified Life-Cycle Celebrant ™ and Professional Wedding Officiant. 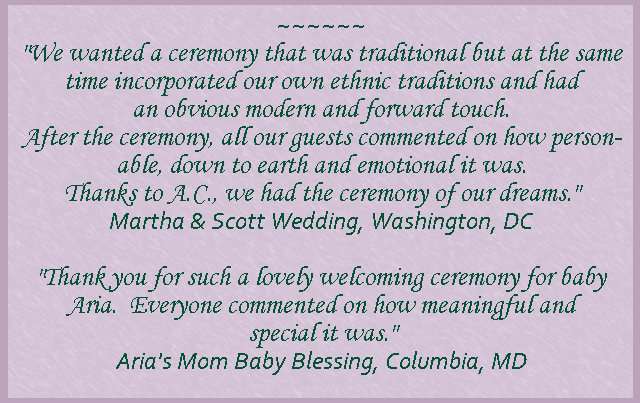 Since 2004, all my ceremonies (weddings, baby welcomings or namings, funerals and memorial services) have been designed with you in mind. They have been spiritual, religious, interfaith, non-religious, multicultural, and even multi-lingual. I am proudly gay-friendly and have performed many commitment and elopement ceremonies over the years. I love helping you find music, readings, rituals (like Hand-Fastings, the Seven Steps, or Jumping the Broom) and language (such as personalized wedding vows) that reflect who you are. You can also involve family members, friends and even pets in meaningful ways. Together, we design your ceremony so that it expresses your most important beliefs and your personalities . I look forward to working with you to create the ceremony of your dreams. Please contact me to set up a free consultation so we can discuss your ceremony.